This is one of my favourite garnishes for tropical flavour desserts. Fresh coconut has a very mellow and rich taste which no dried prepackaged stuff can compare. 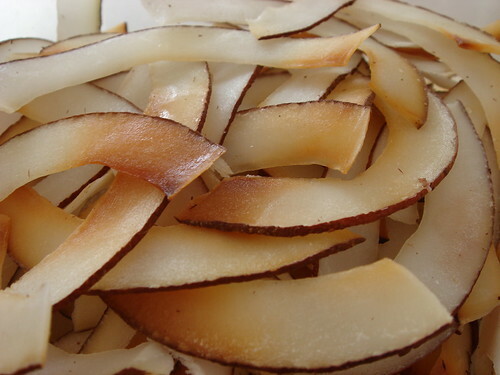 This recipe lightly caramelize the coconut stripes and toast them until they are crunchy. They are so delicious that I can eat them by the handful and forget about using them in my plated desserts! Preheat oven to 400F. Line a baking tray with silicon liner such as Silpat. In a large mixing bowl, toss together the coconut stripes and syrup until the coconut stripes are evenly coated. Spread evenly on the prepared baking tray. Bake for 10 minutes and shuffle the coconut on the tray so that they can caramelize evenly. Bake for another 10 minutes or until they're lightly browned. The coconut will turn a little crispy after they're cooled on baking tray. Store in airtight container. I am very capable of handling tough situations. However, it doesn't mean that tough situations don't upset me. Remembering my adolescence, I learned to be independent and invulnerable, taking up the role as the "man of the house". I learned that there is merit to proximity. My dad lived half way across the globe in a different timezone. By the time that we got to chat on the phone, all the drama and all the emotions have already been dealt with. It was a mere routine report to keep everyone up to date. Going out with you is stirring up all those memories which I would rather bury. When I was sick and feverish, I left you a message because I wanted to talk to you and to know that you care. But when you finally got in touch with me half a day later, my fever had already subsided and I was buoyed by the love and care of my family and friends. The moment when I was most vulnerable was already long gone. I was very upset today by things beyond my control. I let you know that I was incapable of making weekend plans because I was so blinded by anger and frustration. Again, I needed you and you weren't there. When you finally got in touch with me hours later, I saw that you did not understand how much the situation upset me. My friends did...they came to me in my hour of need. I'm certain that when I tell you what happened today, it would merely be a lighthearted report, perhaps even funny depending on my storytelling talent. I don't know what to make of this. Obviously something is amiss. It's not like I bottled up without telling you a thing and then blamed you for not reading my mind. I told you that I needed you but the message just didn't register any urgency on your mind. You probably don't understand how much this is troubling me. It is setting off all kinds of alarms in my head and frankly, it is strike two. I really like you but these are warnings that I cannot ignore. You made me feel like I'm to face the world on my own and that is not how I want to live my life. If I want to face the world alone, I can do that without getting involved with you. A few skating friends and I decided to have a little celebration for the Lunar New Year with dinner at a hot pot restaurant. To me, hot pot is great comfort food when the mercury dips. 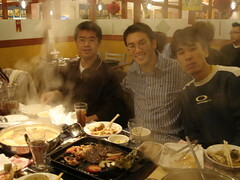 Besides, the interactive and communal aspect of this eating style is great fun for a group dinner. Interestingly enough, I'm actually the only hot pot veteran in our group. Some of us never tried hot pot before and some only enjoyed it at home. After asking for recommendations from friends and family, we finally decided on Hot Pot King in Markham. Personally, I'm a little picky about hot pot restaurants. 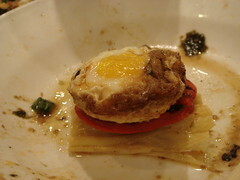 Most of these places are all-you-can-eat so the variety and freshness of ingredients can make or break the experience. However, more importantly, I want the place to be clean!!! I've seen some dubious hot pot restaurants before so cleanliness (or at least the appearance of cleanliness) matters to me. Hot Pot King fits the above description well. Not only that, the service is excellent for a Chinese restaurant. The self-served sauce and soup base station is a nice touch. My friends and I had a blast trying to create dipping sauces to our own liking. The best part though, was the pot-to-diner ratio. 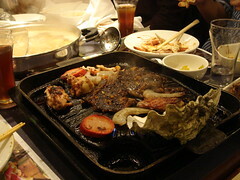 Between our group of 6, we had two pots containing four kinds of broths and a Korean-style grill. This means each of us could easily access some cooking utensil without having to reach far. Having hot pot dinner with 5 athletic guys is certainly very different than any of my previous hot pot experience. 85% of the food we ordered were protein!!! I was somewhat expecting the meal to progress from protein (meat & seafood & dumplings) to vegetables (leafy greens, turnips, taro, mushrooms) to starches (noodles). However, by the time we got through all the meat and seafood that we ordered, we were already too stuffed for much else. That's not to say we didn't eat much...we just ate a lot of meat! Creativity was never something that I would typically associate with hot pot dinner but ML taught me something new today. He took an egg from the sauce station and cracked it into a groove of the grill. I didn't expect the egg would come out in one piece but apparently, all the grease and juice from the grilling meat "seasoned" the grill well enough for the egg to cook to perfection. Along with some grilled sausage and poached bean curd, ML created his version of eggs benedict, hot pot style. I bow to his innovative spirit and sense of adventure. 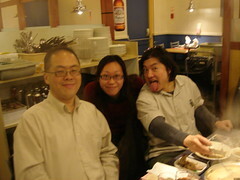 Lunar new year is a time to celebrate with good friends and good food. I must say we had both of them aplenty tonight. Pictures are available here. 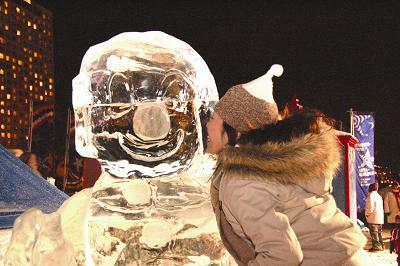 I can't believe I haven't been to the famous Carnaval de Quebec until last weekend, after spending 18 winters in Canada. If you don't know already, I'm a big fan of winter. I love the cold, the snow, the wind, and of course the layers and layers of clothes that I can pile on until I feel like the Michelin man. The prospect of spending hours in an outdoor festival celebrating all things winter is exactly what I needed to cheer up from my miserable flu. The admission to the festival is $10 and in lieu of tickets, each visitor receives an Effigy Pass. This English translation makes absolutely no sense to me because I first learned of the word "effigy" from displays of wooden dummies sitting in the basement gallery of ancient churches in London. Fortunately, the image that the effigy pass evokes is much less morbid. 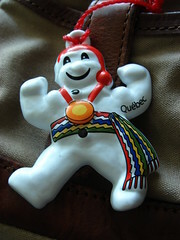 It is in fact a little plastic figurine of the Carnaval mascot Bonhomme that everybody hangs on their jacket. On the back, it was etched with the dates of this year's Carnaval. What a thoughtful little souvenir! 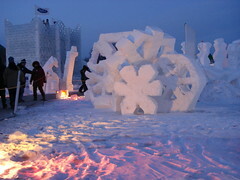 My friends and I spent much of the afternoon in Place Desjardins, a huge playground of all things made of snow. There were many gorgeous snow sculptures that we ah-and-ooh'ed over but of course the main attraction for me was enjoying a freshly fried cinnamon and sugar BeaverTail. As soon as we reached the food section, I immediately made a beeline for the BeaverTail shack. This greasy warm sugary treat is one of the reasons why I love going on ski trips. BeaverTails vendors are most likely found in places associated with "outdoor" and "snow" and "ski". If I remember correctly, they have outposts in Blue Mountain (2 in fact! 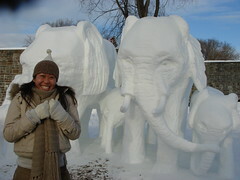 ), Mont Tremblant, Ottawa by the Rideau Canal, and of course at the Carnaval. 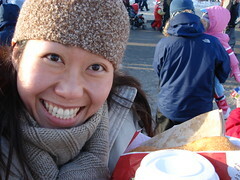 Here's a picture of me about to enjoy a BeaverTail and a steaming cup of hot chocolate. In addition to BeaverTails, maple taffy (la tire sur la neige) is also a very Canadian delicacy to enjoy during winter. Basically, you have maple syrup that is cooked to a high temperature to evaporate some moisture content. You then pour a stripe of syrup on a fresh bed of snow. The chill of the snow would conveniently cool down the syrup to a chewy consistency. Once it's ready, you put a wooden stick on one end of the taffy and roll until all the taffy end up in a neat little ball on the stick. Inevitably, the taffy would have crystals of snowflakes mixed in...just the way I like it. By this time, it had been hours since we arrived at the Carnval and of course staying outdoor for how long would get chilly. 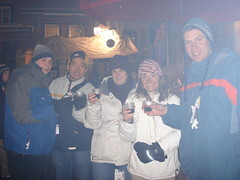 What's a better way to warm up than a warm cup of mulled wine? By my logic, there was absolutely no reason why there would be no mulled wine/vin chaud/glogg on sale somewhere here and proposed a search for this beverage. As soon as JV, EZ, and I made our way into the SAQ Bistro, JV happily claimed that he smelled vin chaud. The three of us stood in front of the menu for a long time, yet none of the item resemble vin chaud to our eyes (it's not because of any language barrier...all of us can read French just fine). There was only one item on the menu which looked unfamiliar, a spirit by the name of Caribou (Caribou liqueur aperitive by Mondia Alliance). A little Q&A with the guy next to us in line revealed that indeed Caribou was what we were looking for! 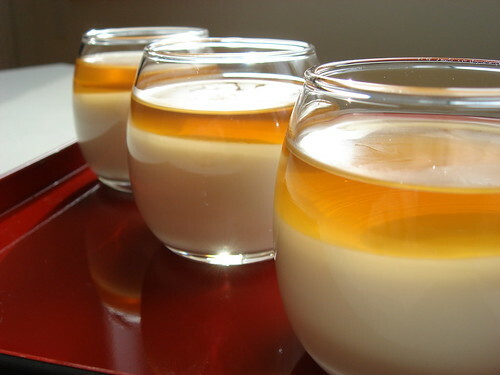 This Quebec specialty is a 24% aperitive typically served warm in winter fairs. At $4.75 per 2oz serving, we thought it was a little overpriced until we took a sniff from the steaming cup. Boy, this stuff was strong! It was just the thing to warm up the body. I was a little sad to see the sunlight faded away but honestly, the beauty of Carnaval at night quickly swept my disappointment away. All the snow and ice took on a whole different characteristic when illuminated by colourful lights. A little more glamourous, if you will. We enjoyed a dinner of traditional Quebec fare including Canadian pea soup, tourtiere, and tarte au sucre. 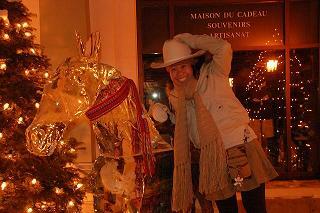 Outside of the quaint bistro, there was an ice sculpture of a horse completed with saddle, hay stack, and cowboy hat. How could I resist the temptation for a photo-op? We continued our night with a highlight of the festival: Bonhomme's Parade. Well, the parade itself is not much different from Toronto's annual Santa Claus Parade. However, the spirit of the crowd was what made it special. I felt a little silly for getting so excited when Bonhomme's float drove by...but it was silly fun like I hadn't enjoy in a very long time. I would highly recommend anyone to brave the cold and experience this marvelous festival celebrating all things good about Canadian winter. I think you'll enjoy the festivity as much as I did! Since I last posted, I have been sick the ENTIRE time. 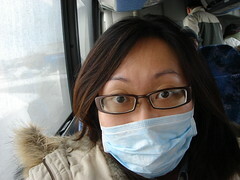 I don't know how this bout of flu could turn out to be so bad but needless to say, I wasn't myself in the last few weeks. Now that I think about it, I felt like lots of things happened but at the same time, lots of time was wasted on nothing. Sure feels very strange. An opportunity has come up recently for me to join the most competitive team in my dragonboat club. I'm thrilled about this invitation but it also means that my summer schedule will be hectic with all the training and competitions and regattas combined. I feel very driven....to exhaust myself until I break down. It's a strange thought that's a little disturbing to me. Anyhow, off to my first dragonboat team meeting! I'll post some fun stuff tonight about dessert and Carnaval at Quebec City.